Eben Sadie’s signature series red that is Columella grows ever more sophisticated, the recently released 2014 a blend of 60% Syrah, 22% Grenache, 15% Mourvedre with the remainder being Cinsaut, Tinta Barocca and Carignan, maturation lasting 12 months in barrels, about 5 to 8% new, followed by a further 12 months in old, large format casks. On the nose, plums and red cherries, a hint of spice and subtle vanilla. The Swartland trademark aromatics of fynbos, olive and earth are also there but pushed way back while anything floral is just about absent as if prettiness might contradict gravitas. The palate meanwhile possesses pure fruit, fresh acidity and wonderfully granular tannins. The wine appears not so much tight as ungiving right now but will no doubt gain greater detail with time. Wine Cellar price: R750 a bottle. What would you recommend as an appropriate amount of cellaring for the Columella in general? 8 – 9 years? More, less? Hi Kevin, My instinct is that you could start drinking Columella 2014 two years from now (mid-2018) and it wouldn’t be an injustice to the wine. How much longer to keep it after that becomes a matter of your personal tolerance for developed flavours. I had the maiden vintage 2000 a year or two ago and it was in fine fettle. I had the 2009 a few months ago and it was magic but i believe 6 to 20 years after vintage would be a good drinking window in my humble opinion. Everyone has different tolerance to tertiary flavours. 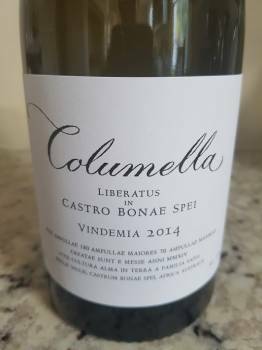 The Columella is definitely a first growth wine of our awesome country.